Debbie Wetzel, Senior Director for the Governance Global Practice, and Leocadia I. Zak, USTDA Director, shake hands after signing a Memorandum of Understanding to formalize the procurement partnership. The World Bank’s Governance Global Practice has been working with the U.S. Trade and Development Agency (USTDA) to help developing and emerging nations implement sound procurement practices and policies for the past 18 months. Leading the implementation of these collaborative efforts are the World Bank’s SIP Group and USTDA’s GPI team. The partnership has the ability to enhance the impact of the World Bank’s new Procurement Framework. WASHINGTON, August 2, 2016 — Every year, governments across the globe make sure that taxpayers' resources are converted into tangible products that deliver critical services to citizens, such as healthcare and access to electricity. In developing and emerging economies with limited resources, procurement solutions that ensure better value for money can mean the difference between patients with drugs, and households and entrepreneurs with energy — and those without. For the past 18 months, the World Bank’s Governance Global Practice has been working with the U.S. Trade and Development Agency (USTDA) to help developing and emerging nations implement sound procurement practices and policies. 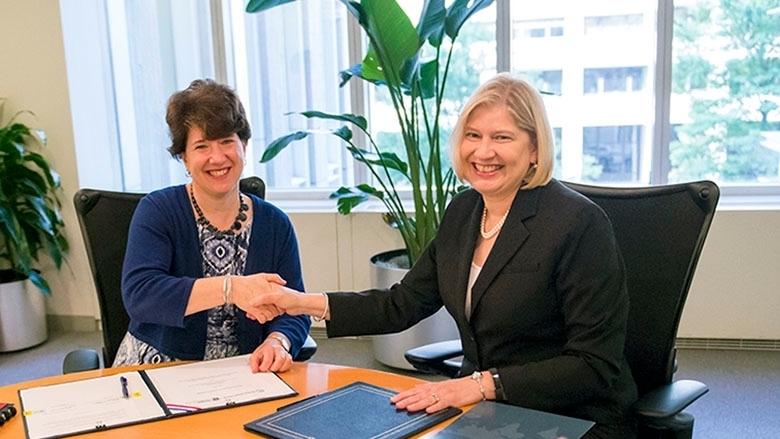 World Bank Senior Director for the Governance Global Practice, Deborah Wetzel, and USTDA Director, Leocadia I. Zak, signed a Memorandum of Understanding (MoU) on Tuesday, formalizing the partnership and securing a platform for stronger collaboration between the two organizations. "When USTDA launched its Global Procurement Initiative in 2013, the World Bank was a key official collaborator," USTDA Director Lee Zak said. "I am so pleased that our organizations are strengthening our relationship, which will go a long way toward ensuring that emerging economies’ procurement practices bring the greatest value for public dollars." As both organizations collaborated on procurement efforts, they have started to see positive results in developing countries. 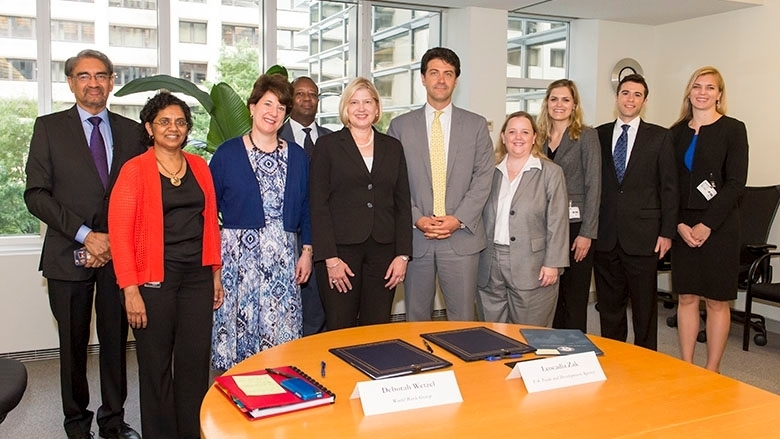 The World Bank’s Solutions and Innovations in Procurement (SIP) and USTDA’s Global Procurement Initiative (GPI) teams are working together to help Ethiopian Electric Power, a large executor of public funds, strengthen its procurement systems. This collaboration is expected to improve the way the Government of Ethiopia procures complex energy projects. It also has the potential to transform numerous other sectors that can be bolstered by access to reliable, affordable electricity. "At the World Bank, we want to ensure that good public procurement helps strengthen governance in developing countries. A modern and robust procurement system can help countries get the best value for money, improve public service delivery, stimulate private sector growth and increase citizen trust in their countries’ capacities to better manage public resources," said Debbie Wetzel, Senior Director, Governance Global Practice at the World Bank. "This flourishing partnership with USTDA is already having an impact. I am delighted that today we are committing to further intensify our cooperation to support our client countries." Another benefit of the partnership is its ability to enhance the impact of the World Bank’s new Procurement Framework, launched officially last month. For example, USTDA has been helping the Government of Botswana achieve value in its procurement processes, providing two procurement advisors to support the Ministry of Minerals, Energy and Water Resources (MMEWR). These efforts complement World Bank assistance in streamlining institutional structures in public procurement and in the professionalization of Botswana’s procurement workforce. As procuring entities like MMEWR strengthen their institution, systems and procedures, they may be able to more quickly build their own capacity to manage and implement investment projects in line with one of the key objectives of the Bank’s procurement framework. Another example of partnership is in Vietnam: Inspired by Vietnam’s revised procurement legislation — which the World Bank was instrumental in supporting — USTDA and the Bank designed a procurement program with Vietnam’s Public Procurement Agency (PPA). USTDA and PPA are currently working together to build a database to track and monitor the performance of contractors who provide billions of dollars in goods and services to the Government of Vietnam each year. The database advances the PPA’s broader e-government goals, which are also supported by the World Bank. Leading the implementation of these collaborative efforts from each organization are the World Bank’s SIP Group and USTDA’s GPI team. The SIP — a department within the World Bank’s Governance Global Practice — focuses on advancing modern and open procurement systems, integrity in procurement and its fiduciary functions. The SIP also contributes to the effectiveness of the World Bank’s supported operations in over 1,600 investment projects in 173 countries, with a current on-going active portfolio of around $US 200 billion. This includes work on strengthening national institutions to build open and competitive procurement systems, supporting client countries in achieving value for money in public procurement to enhance service delivery and development outcomes, creating the space for procurement innovation, and establishing proactive processes to identify and deploy knowledge to solve specific problems. Under the GPI, USTDA trains public procurement officials in developing and emerging economies on how to establish strong, efficient procurement practices and policies in a fair, transparent manner. GPI programs offer procurement officials access to globally renowned procurement experts during training workshops and study tours, the opportunity to see how U.S. procurements are structured, and support through in-country advisors who help put lessons learned into practice. USTDA expects the adoption of these standards and practices to lead to smarter, longer-term investments with overall savings to host governments, in addition to fairer public procurement systems. U.S. Executive Director to the World Bank, Matt McGuire (center) joined representatives from both the World Bank Group and USTDA teams. Common procurement goals have brought the World Bank and USTDA together to produce meaningful results. The partnership is also expected to facilitate opportunities for the World Bank to share GPI’s technical resources in countries where mutual interests exist, with an aim of increasing the impact of the Bank’s new Procurement Framework.